Can’t stop dipping into that guacamole bowl? These 100-calorie snack packs serve up lots of flavor while keeping portion sizes in control. The taste factor: This prepackaged dip tastes as fresh as homemade—sans messy avocado mashing. Try classic for a mellow garlic and onion taste, and spicy for extra heat, thanks to a jalapeño puree. The health factor: Avocados are high in heart-healthy monounsaturated fats and full of potassium and fiber. And the portion-controlled 100-calorie pack keeps them diet friendly. 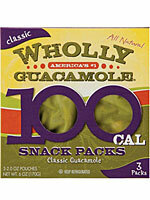 Editor’s pick: Spicy Guacamole adds a little extra zing to my afternoon snack. Why we love it: These grab-and-go individual servings are a perfect way to stay healthy while eating a food I love.